The MCommunity Sponsor System allows authorized U-M staff members to create online identities for university-affiliated individuals who do not receive uniqnames and online identities otherwise. Sponsored individuals include conference attendees, contractors, incoming faculty who need access to U-M resources before the hiring process is complete, academic affiliates and others. This document provides an overview of the Sponsor System, with details about uniqname types, identity types, sponsorship lengths, minimum data requirements, sponsorship expiration handling and password resets. For step-by-step system use instructions, see Using the MCommunity Sponsor System Via the Web. What Is the Sponsor System? MCommunity is a system that stores online resource access information about members of the U-M community at both the university and departmental levels. It is a flexible, centralized, identity management system that U-M campuses and units can use in decentralized ways for providing access to information technology resources and services. The most visible part of MCommunity is the MCommunity Directory. To learn more about MCommunity, see MCommunity Overview. The Sponsor System is the part of MCommunity that is used to create uniqnames and online identities for sponsored affiliates, people who are affiliated with the university but who do not receive uniqnames otherwise. Sponsored affiliates include, for example, conference attendees, contractors, incoming faculty who need access to U-M resources before the hiring process is complete, and others. The Sponsor System allows units to sponsor people as members of the U-M community for specified periods of time. An individual may be sponsored by more than one unit. Authorized U-M staff members can use the system. To use the system, you must become a sponsorship administrator. Sponsor: A U-M department or unit that sponsors creation and/or management of identities in MCommunity. Sponsoring Authority: An individual who authorizes sponsorship administrators for specified university departments. It is the responsibility of the sponsoring authority to oversee the sponsorship administrators s/he has authorized and ensure that appropriate policies and guidelines are followed. For more information about sponsoring authorities, see MCommunity Sponsoring Authority Policies and Agreement. Requester: An individual in the sponsoring department who requests a sponsorship. For example, a conference organizer might request sponsorships with temporary uniqnames for a group of conference attendees, or an administrative staff member might request a sponsorship with a regular uniqname for an incoming faculty member who needs early access to online resources. In some cases, the requester might be the sponsorship administrator. 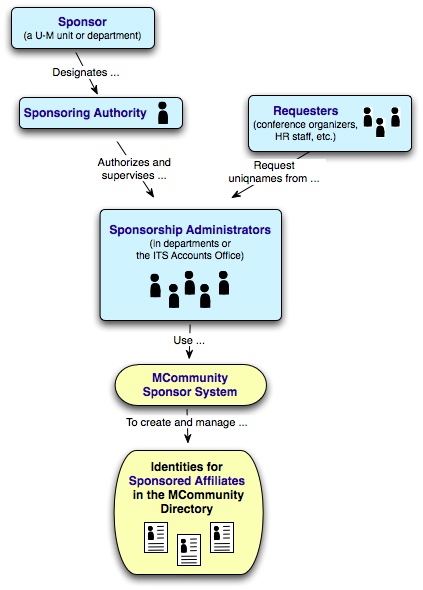 Sponsorship administrators: Individuals who use the MCommunity Sponsor System to set up sponsored identities and uniqnames. For more about sponsorship administrators, see MCommunity Sponsorship Administration Policies and Agreement. The Sponsor System can assign regular and temporary uniqnames. See the Sponsorship Components Chart below for details about uniqname differentiation. Regular uniqnames: Most members of the university community have regular uniqnames. They are made up of three to eight alphabetic characters (for example, bjensen). Regular uniqnames are assigned for life and are never reused. Individuals with regular uniqnames who leave the university and return at a later date can usually reclaim their uniqnames and no one else can use them. However, if a sponsored individual with a regular uniqname and minimal identity information on record (that is, a weak identity) leaves the university and returns later, there will not be enough information available to match records in other university systems to verify that this is indeed the same person; in this case, the uniqname cannot be reclaimed, and a new uniqname is created. Temporary uniqnames: Temporary uniqnames are intended for short-term use. They consist of um, followed by a number generated by the MCommunity Sponsor System (for example, um000000). If a sponsorship and temporary uniqname have expired, a new temporary uniqname is allotted. The identity type is determined by the amount of data collected and depends on whether or not the sponsored individual needs a regular uniqname and UMID. See the Sponsorship Components Chart below for details about identity types. Strong identity. Most members of the university community have a strong identity. A strong identity in MCommunity has adequate identity data to confidently match it against identities in other U-M systems. A strong identity results in an entry in Wolverine Access and the creation of a UMID (U-M identification) number. For U-M employees, this number is often referred to as an Emplid. People who are paid by the university are required to have a UMID in M-Pathways. A strong identity requires one of the following data combinations. If the person being sponsored already has a UMID, this information is already on file and does not require re-entry. The ITS Service Center can do UMICH password resets over the phone for individuals with strong identities; there is sufficient information on record to verify their identities. Important! The Sponsor System does not store Social Security numbers. It uses them to search Wolverine Access in order to prevent the creation of duplicate entries. Once it completes the search, it discards the Social Security number. Weak identity: Minimal information is required to create a weak identity entry in the MCommunity Sponsor System; A first name, last name, and a non-UMICH email address will suffice. Such identities are generally reserved for short-term use. Uniqnames associated with weak identities cannot be re-used by their owners after they expire because there is no way to verify identity. People with weak identities who forget their passwords must go to the departmental entity who originally requested their sponsorship for password resets. The requester can ask a departmental sponsorship administrator or the ITS Service Center to reset the password. Either way, the requester must verify the individual's identity; no one else will have sufficient information on record to do so. The requester's identity must be verified before the ITS Service Center can reset a password for a sponsored individual. The reason for a sponsorship is defined by the relationship the sponsored individual has with the university. It also depends on whether a regular uniqname and UMID are necessary. The sponsored affiliates listed below receive a regular uniqname and a UMID. They are listed in Wolverine Access and MCommunity with a limited "self-service" role. This allows them to update their address, phone number and emergency contact information, set a preferred name and sign up for U-M Emergency Alerts. Incoming Faculty/Staff: When units need incoming faculty and staff to have access to U-M computing resources before they have completed the hiring process, the units can sponsor them. These individuals require a regular uniqname and a strong identity so there is sufficient information on record for their employment data to be matched to their sponsorship entry. Temporary Staff: Temporary staff members are hired by units for up to one year. Non-student temporary staff who are hired through eRecruit get uniqnames during the hiring process. If a non-student temporary staff member is hired outside of the eRecruit process, use the "Temporary Staff" reason to obtain a sponsorship and regular uniqname so they can access their personal information in Wolverine Access. Even if they already have a uniqname from a previous relationship to the university, they will need to be sponsored so their uniqname can be reactivated and their Wolverine Access self-service role can be set up. Contractors: Contractors work in university departments, but they do not have a U-M job appointment. These individuals often perform the same professional duties as U-M staff members, may be granted access to critical university business systems and are held to the same standards of accountability as University of Michigan staff. For these reasons, a contractor also requires a regular uniqname and a strong identity. Academic Affiliates: These are people who have an academic relationship with the university but who are not U-M students or faculty members. Visiting nurses, visiting scholars and other academic visitors are in this category. They require a regular uniqname and a strong identity for stipend or ID badge reception from the university. Other University Affiliates: These are people who require a regular uniqname and a UMID but who do not fit any of the previously listed sponsorship descriptions. Perhaps, for example, their relationship to the university is more administrative than academic, or their role is unique to the unit with which they are affiliated. The sponsored affiliates listed below receive regular uniqnames without UMIDs. They have temporary entries in MCommunity and are not entered in Wolverine Access. Once the sponsorship expires, the uniqname cannot be reactivated, and computing services associated with it cannot be reinstated because there is insufficient identity data on file for identity verification. When the sponsorship expires, the entry is removed from MCommunity. Long-Term Guests: These are individuals who need access to services that require a regular (not temporary) uniqname but for whom only minimal identity data is available. The benefit to departments of this sponsorship type is that the sponsorship can be set up quickly. A UMID is not connected to the sponsorship, and you may need assistance with acquiring one in the future. Note: The sponsored guests listed below receive temporary uniqnames. When the sponsorship expires, the entry is removed from MCommunity. The uniqname is essentially disposable; if the sponsorship expires, a new temporary uniqname can be created. However, services associated with the expired uniqname cannot be reinstated and associated with the new uniqname. Conference/Program Participants: These individuals receive a temporary uniqname for the duration of a conference or other program. Short-Term Guests: Use this category to sponsor short-term guests who require a temporary uniqname and do not fall into any of the previously listed categories. Note: Sponsorship administrators can change the suggested (default) sponsorship length when they set up sponsorships. The maximum length is 1 year. All sponsorships are renewable as long as they have not yet expired. Sponsored affiliates automatically receive the Standard Computing Services (with the exception of printing, which can be requested). Note: Access to services ends when the sponsorship expires. Note: When sponsorship administrator sets up sponsorships, he/she can select preferred sponsorship and expiration emails to be sent by the Sponsor System. Important! The sponsored individual's UMICH password will be displayed on the Sponsor System screen at the end of the sponsorship creation process. It is the sponsorship administrator's responsibility to note the password and relay it in a secure manner to either the requester or the sponsored individual. See Appendix: Sample Email Notifications below for the email text. Sponsorship administrators can change when and to whom expiration warning emails are sent by editing sponsorships. All sponsorships have a start date and an expiry date. The maximum sponsorship duration is one year. However, sponsorship administrators can renew sponsorships as often as necessary-as long as they are still active. What happens on expiry depends on the identity type-strong or weak. If a person has multiple sponsorships, the expiry process happens when the final sponsorship ends. Note: These sponsorships require enough identity information to create an entry in Wolverine Access. The uniqname is deactivated (that is, the sponsored person can no longer log in to anything using that uniqname). Because Wolverine Access entries are created for sponsored individuals with strong identities, their uniqnames can be reactivated with sufficient proof that the person requesting reactivation is indeed the person the original uniqname belonged to. The sponsored individual's entry is removed from the MCommunity Directory. This means that email forwarding stops. Any computing services (such as U-M Google) assigned to this uniqname are terminated on the date the final sponsorship ends. Note: If a sponsored person with a strong identity becomes an employee or student, their uniqname and any associated ITS computing services will stay effective indefinitely due to the updated affiliation. Note: These sponsorships require minimal identity information and do not result in a Wolverine Access entry. The uniqname is deactivated (that is, the sponsored person can no longer log in to anything using that uniqname). The sponsorship entry is removed from the MCommunity Sponsor System. The uniqname is permanently retired and therefore unavailable (that is, it can never be used again). The uniqname is retired because there is not enough identity information on record to validate the person's identity for re-use of the uniqname. The identity has fully expired. Any computing services (such as U-M Google) assigned to the retired uniqname are terminated. Computing services cannot be reactivated transferred to a new uniqname. Tip: When you set up a sponsorship, set the expiration date to allow yourself some extra time in case you later need to extend the sponsorship. For example, you might set the expiry date for a conference sponsorship to be five days after the end of the conference. Tip: If you expect the sponsorship will require renewal, select expiry warning messages during sponsorship creation that will give the appropriate individuals enough warning time so they can can complete renewal before the sponsorship expires. Tip: Tell sponsored individuals that if they wish to keep any files or messages after their sponsorship expires, they will need to save them ahead of time. They can send them to their non-UMICH email account, save them in a non-UM file storage account (Dropbox) or on a flash drive. Sponsored individuals can change their own UMICH passwords using the same password changing page (login required) used by all other members of the university community. Sponsored individuals with regular uniqnames and strong identities must call the ITS Service Center to have their passwords reset if they have not set up account recovery information. There is enough information in MCommunity about these people for the Service Center to verify their identity over the phone or in person-and therefore to reset their passwords. This includes contractors, incoming faculty/staff, temporary staff, academic affiliates, and others. Sponsored individuals with regular or temporary uniqnames and weak identities must contact their requester (the person who requested their sponsorship) for password resets. The requester can ask either a departmental sponsorship administrator or the ITS Service Center to do the reset, but it is the responsibility of the requester or departmental sponsorship administrator to verify the sponsored individual's identity and oversee the security of the process. This includes long-term guests, conference/program participants, and other short-term guests. You cannot change the business reason for a sponsorship after the sponsorship has been set up. You cannot, for example, change a contractor to an incoming staff member. However, you can add a new sponsorship with a different business reason (with some limitations depending on the uniqname type). An individual can have multiple sponsorships with different start and expiry dates. See Adding Sponsorships to an Already-Sponsored Person in Using the MCommunity Sponsor System Via the Web for instructions. Sponsored individuals with temporary uniqnames can only have additional sponsorships that also use temporary uniqnames. If you wish to create a sponsorship with a regular uniqname for an individual who currently has a temporary uniqname, you must create a new sponsored identity. The temporary uniqname will expire via the previously outlined expiry process. Sponsored individuals with regular uniqnames can only have additional sponsorships that also use regular uniqnames. Adding a sponsorship that results in a strong identity to the entry for a sponsored person whose current sponsorship has a weak identity (that is, a long-term guest), is problematic because of issues regarding the assignment of a UMID. It may not be possible for the person to keep the same uniqname under these circumstances. Please contact the ITS Service Center for assistance in such cases. Some sponsored individuals, such as incoming faculty members, will transition from "sponsored" to "regular" status if they are included in one of the authoritative data feeds, such as the feed of employee data from Wolverine Access. MCommunity reconciles the information from Wolverine Access with that in the Sponsor System and allows the person to keep the uniqname he/she is currently assigned as long as there is enough identity information in the Sponsor System to match the two records. It is essential that enough identity data for a strong identity be provided for individuals who make this transition. Note: Email notifications are not sent to individuals sponsored using file import. You are now a sponsored member of the University of Michigan community. You may use the uniqname below, in conjunction with a password and Duo two-factor authentication, to log in to the U-M computing services and resources that your sponsoring department has authorized you to use. If you do not already have a password, the sponsoring department will contact you and provide you with one. If you have forgotten your password or it no longer works, please contact the ITS Service Center. If you have questions about your sponsorship or your uniqname and password, you can contact the ITS Service Center. If you have questions about this or need any changes made, please contact the sponsorship administrator listed above. You can also contact the ITS Service Center. The MCommunity sponsorship(s) listed below will expire soon. Unless these sponsored individuals have other active sponsorships or have become members of the U-M community (faculty, staff, or student), they will lose the ability to use their uniqname and password, as well as their Google Apps UMICH and Active Directory UMROOT account, when the sponsorship(s) expires. To prevent a disruption in service and loss of data stored in Google UMICH, sponsorships must be extended before they expire. Sponsorships can be extended by the sponsorship administrator for your department and by the ITS Service Center.